Our very first kuih raya for this year, biskut cornflakes madu! Also our very first time baking cookies together. Hehehe. We have a lot of Kelloggs Cornflakes in stock. Iz kept on buying more and more expecting me to eat them everyday... You're peegnant, you should eat more. At least munch these cornflakes between meals... I did eat it almost every morning, adding raisins, but it is just too much. 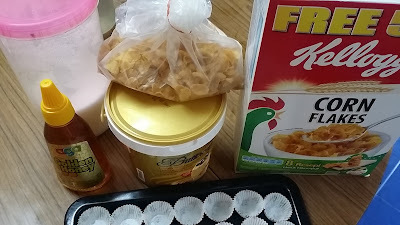 Not wanting them to waste, plus I ran out of excuses on buying new cereals (with flavours), I decided let's just make biskut cornflakes for hari raya. This cartoon turned me off, though. It almost made me cancel my plans. But being the cheapskate that I am, I proceeded anyway. The ingredients are very basic and cheap, no wonder I could find this in almost every house. Cornflakes, butter, sugar, honey. Garnishing is all up to you. Iz decided at the last minute he wanted to drizzle chocolate rice at the top. None available at the shop, so we grated the chocolate block ourselves. The process is also quite simple. Simply melt the butter and sugar together, add in honey, and when they are all mixed up, add in the cornflakes. We crushed them a bit before throwing them in. 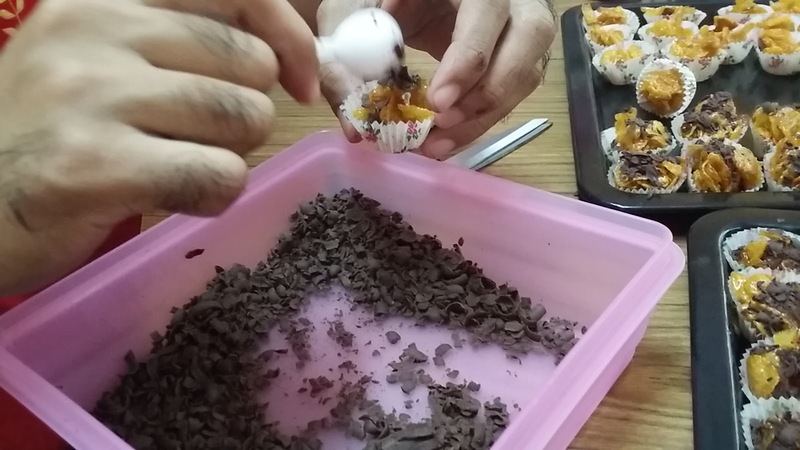 The measurement is supposed to be 1 block of butter, 1 cup of sugar, half a bottle of honey, and one large box of cornflakes. Such a basic recipe. How would I know if I use the same cup like the recipe owner use? And half a bottle of honey? There are many types of bottle... As for the cornflakes, we didn't have exactly one big box of cornflakes. We have like half a small box, a quarter of the big box, and so. As for the butter, I figured out one block of Buttercup is 250g so I simply weigh it out from the tub. Iz and I both have never make honey cornflakes cookies before. Mum came to check on us once in a while. Hahah. 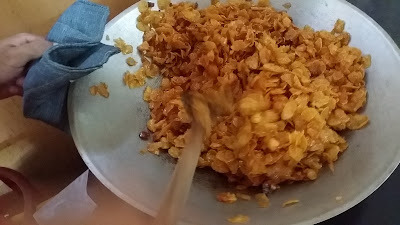 When adding cornflakes (should have just checked how many grams is a big box of cornflakes), Iz said we should add more because in the picture, nampak penuh satu kuali. And I too, went to check the picture. Hahaha! 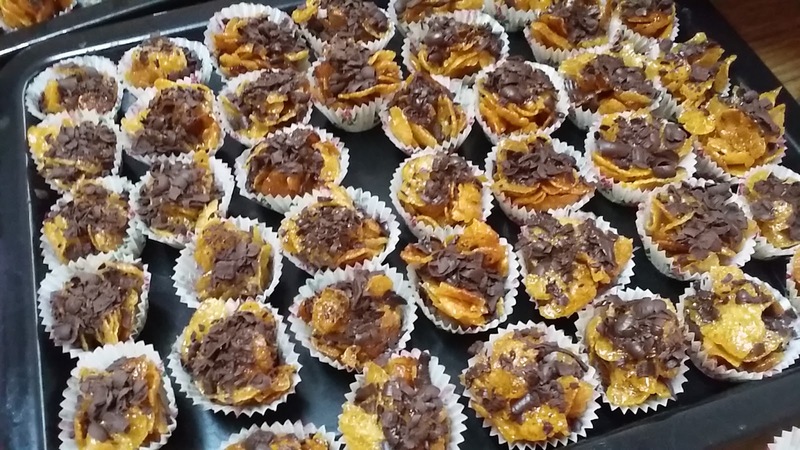 But basically we just added more cornflakes until we have no more butter mixture left. Done mixing, we transferred them into small cups and put some grated chocolate on top. Iz put so much the cornflakes cannot be seen already! Into the oven 5 to 10 minutes. Ours at 10 minutes baked better and crispier. It is indeed, very easy to make. You'll surely get it right as the process is simple. But oh so renyah and leceh when placing them into the cups. Seriously I have no patience in spooning them into the tiny cups! Most of the time I use both my fingers and the spoon. Kaut and letak in the cup. We managed to get 4 medium sized jars (each have about 50 pieces inside) which is way more than we expected! 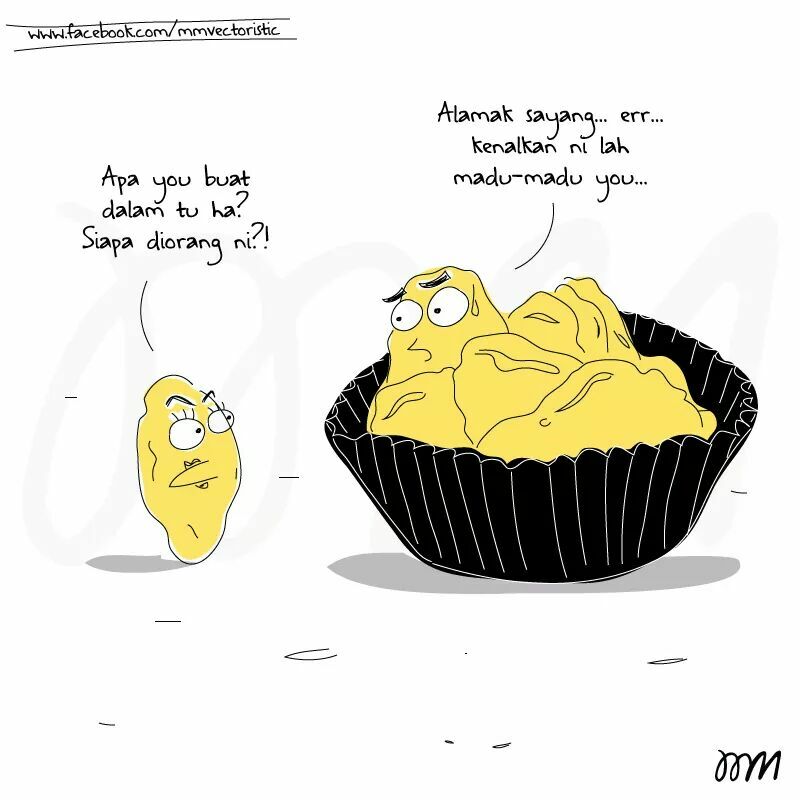 Iz said we should start selling biskut cornflakes madu now. I added, yeah, and my kek batik too.